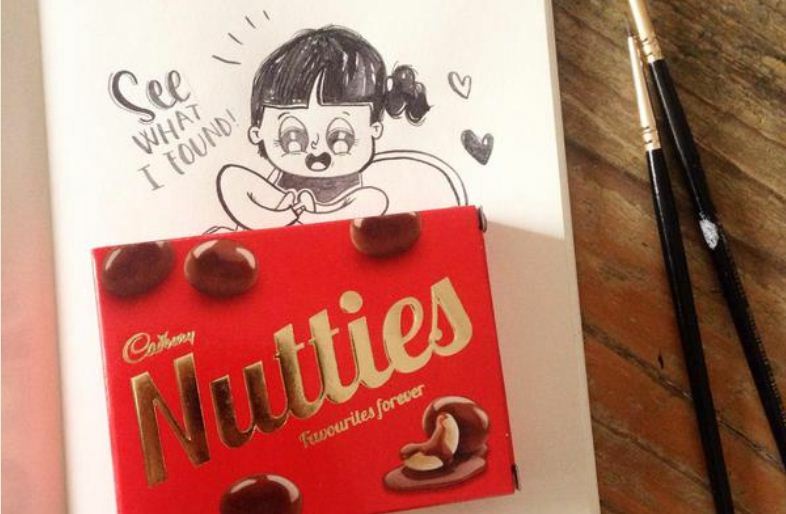 Alicia Souza who is an exceptional illustrative designer noticed that Cadbury Nutties is back in stores and decided to create these amazing caricatures and cartoons including Nutties in a very creative manner. Where has all the Nutties gone? There were several conversations on social media that Nutties had gone off shelves. Quora even has an entire discussion on why Cadbury Nutties were not found in shops! 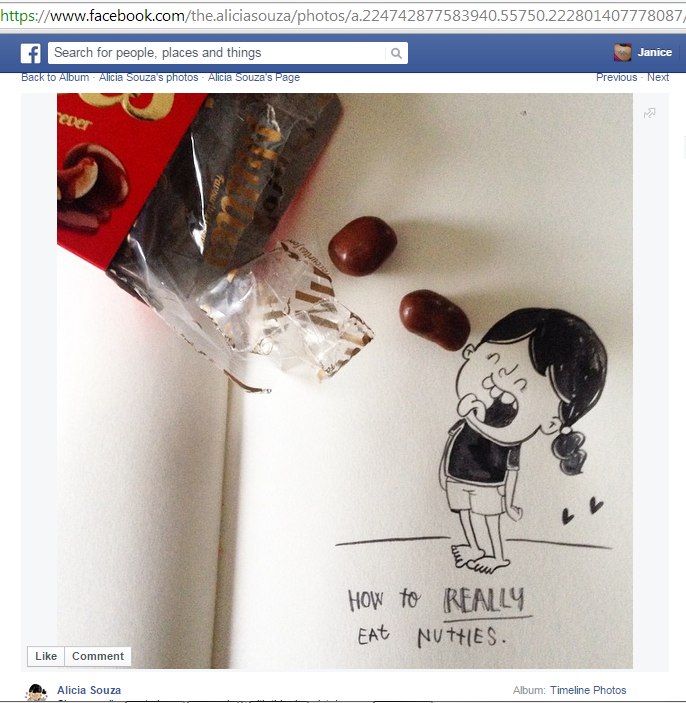 Alicia Souza a designer from Bangalore noticed these conversations online, FOUND Nutties in a shop and started creating these interesting caricatures involving Nutties pellets and boxes. 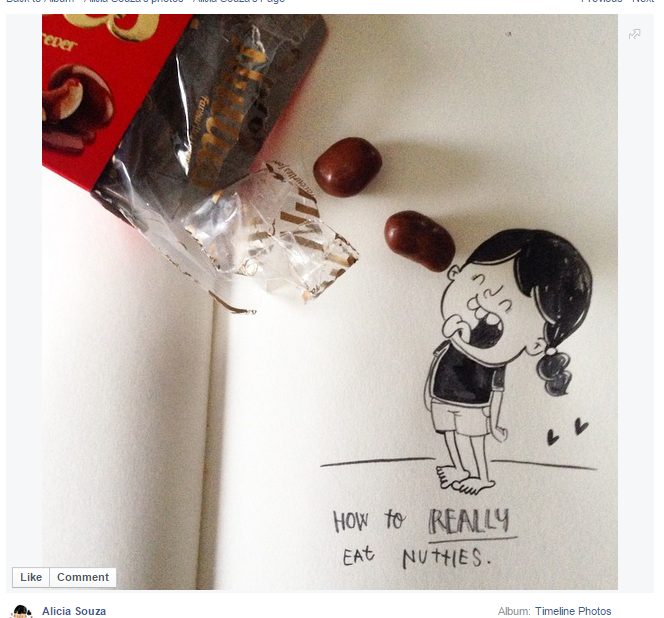 What was interesting to note was that the manner in which she used Nutties in her sketches intrigued many on social media and these went viral organically. If you see Alicia’s page and blog you will instantly know why we think that she is an exceptional artist and why her sketches already have a decent fan following. Alicia has a fan following on Facebook (currently at 49,065), Instagram (currently at 3972) and Twitter (currently at 2,167). 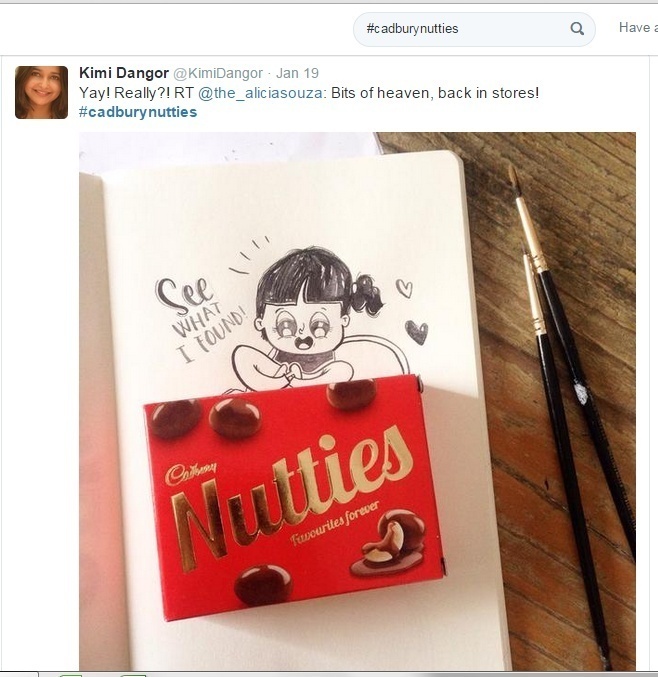 She also used #CadburyNutties which were picked up by many on Twitter and Facebook that made her sketches go viral organically. She has this innate way of bringing about the ‘fun’ element in her sketches by weaving in Nutties when giving glimpses of her personal life to her followers. For example she used Nutties pellets and box to celebrate the birth of her nephew by creating this cartoon of a clown evoking some funny comments, replies and retweets. (Just look at how creatively she uses the pellet as a balloon! 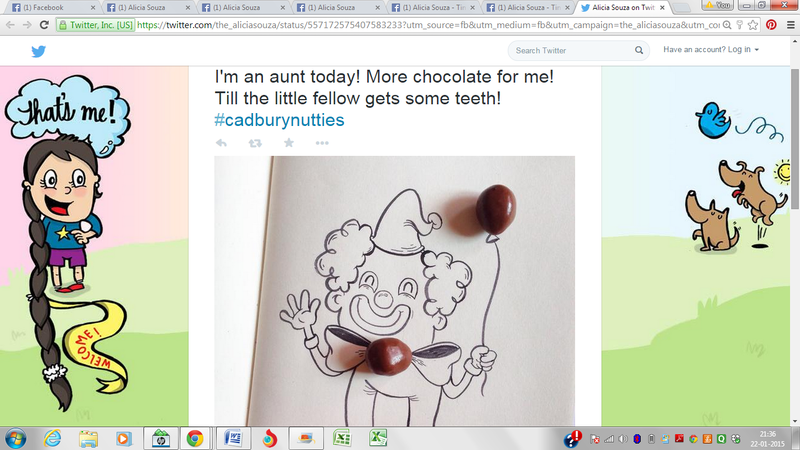 The #CadburyNutties has been picked up by some people on twitter as well, almost always with an exclamation of joy and her Facebook posts got a lot of engagement. Alicia’s sketches appealed to an audience who were nostalgic about Cadbury Nutties and genuinely wanted it in store. What we also really want to see is how Alicia now explores additional humor angles with a more current feel to it – something that people can relate to and have a discussion about rather than just share and like – and say wow in comments. Probably that is something we will see in the next few days when Alicia adds more tweets and sketches, a little more aggressively than she is now – because really we are already hooked! Also apart from Instagram, Twitter and Facebook, Youtube would have also be a place which Alicia could have explored – uploading a video of herself sketching! This would have also got some more shares and tweets. With such an interesting and innovative artist proactively promoting Nutties, Cadbury could use this impromptu campaign as a teaser to incite people into buying Nutties. 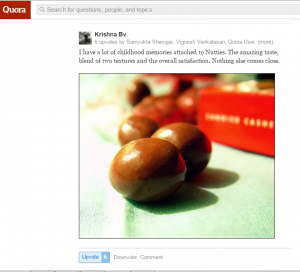 Also the brand can get great PR mileage with the current conversations circulating across social media platforms. Cadbury unknowingly helped Alicia create art which connects with masses instantly! Using real elements in art is something not commonly heard of and in the bargain it created compelling and engaging content! Thanks to Cadbury Nutties for inspiring Alicia. 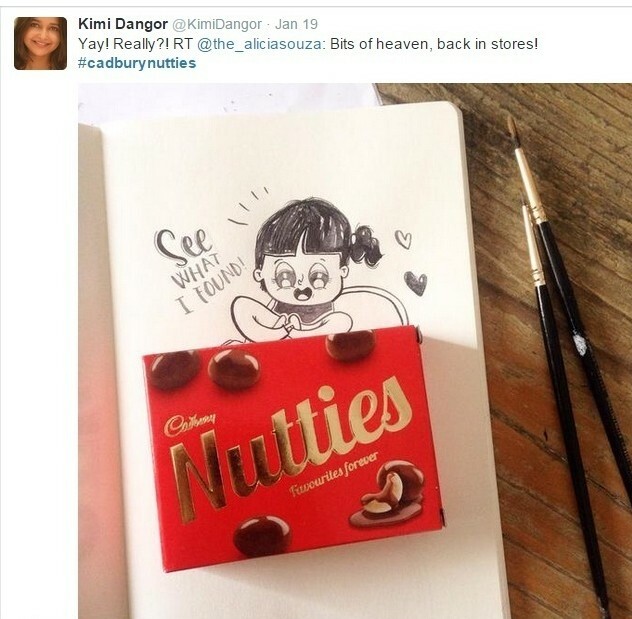 The creative world just discovered Alicia Souza’s art and we chocolate lovers found Cadbury Nutties all over again!